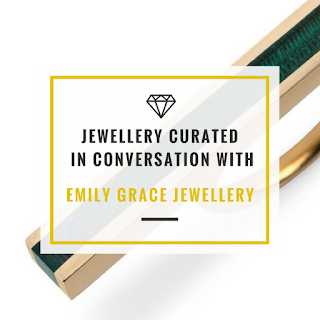 With a love of jewellery from an early age, Emily possesses a love of colour and craftsmanship, that has inspired her to launch her new collection featuring a mix of precious metals, colourful resins and vibrant gemstones. From her studio in London, Emily takes us through her new Iris collection featuring her statement Iris rings and tells us why she's excited for 2018. Tell us about your background and what led you to become a jewellery designer? Like most women, my obsession with jewellery began in the early days of scavenging through my mother’s jewellery box. Once I had finished school and truly thought about my future, having avoided all non-creative jobs, I was desperate to find a career that satisfied my creative needs as well as my skills. Having not focused on a specific craft, rather enjoying many mediums of the arts and creativity throughout my teens it wasn’t until I attended MADE fair in Marylebone many years ago when I had the epiphany – jewellery! I knew I would need those crucial jewellery manufacture and design skills, so I attended The British Academy of Jewellery in Hatton Garden and gained my diplomas. 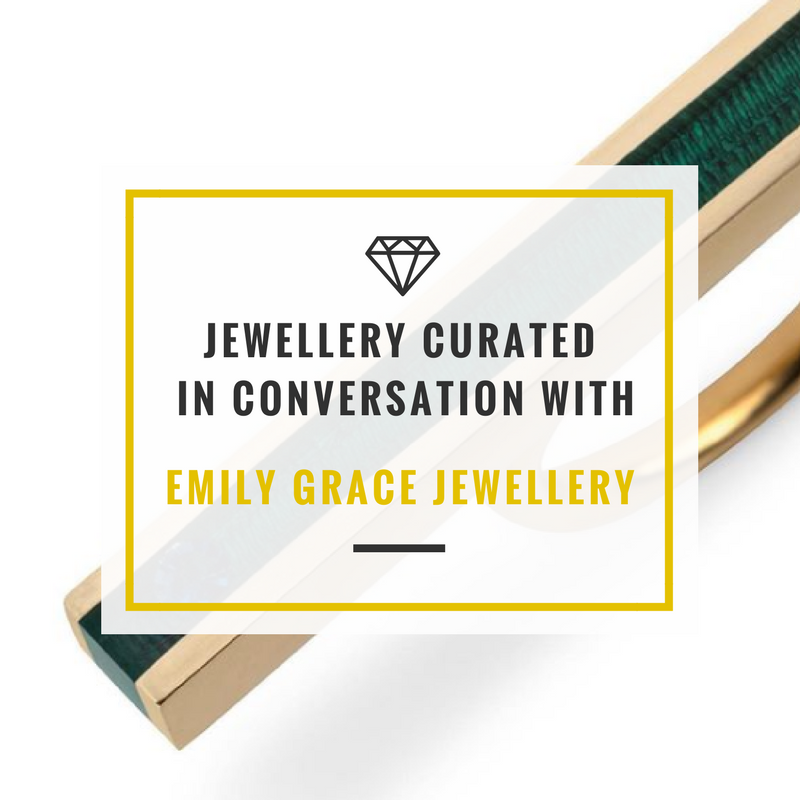 Once I graduated, having spent time working alongside jewellers and designers throughout my studies I took the plunge to create my own line…and here I am today launching Emily Grace Jewellery. Who is the Emily Grace customer? Anyone! I cannot choose my customer the customer chooses my jewellery. That’s what I love about jewellery, it’s purchased on emotion, seeing something and thinking I need this. My collection does not take itself too seriously, it combines many colour varieties and precious gemstones so I enjoy styling my pieces with different outfits and moods, and so do my customers. The Iris Ring is always my statement piece, so I let it speak for itself. The rest of the collection I tend to mix and match. I enjoy using the strong colours to match the rest of my look or if I’m feeling fruity and the sun is out I’ll wear every colour. I have a huge collection of jewellery that I like to incorporate into my every day look so bringing old and new pieces together is always a fashion challenge. What’s the most memorable moment in your jewellery career? Years ago before I began my journey into jewellery, I stated to a close friend “I want to listen to my music and make jewellery.” So in 2016 when I was listening to my iPod, filing and cleaning a pair of earrings at the Shaun Leane workshop that I worked at I realised I had achieved my goal. This was a real milestone for me to recognise that I did what I set out to do and believing in myself from day one really did pay off. Tell us about your beautiful new Iris rings? The Iris Rings are the first pieces from the collection. They are the statement rings that cannot be ignored! The ring sits horizontally across almost three fingers, with a secret diamond set in coloured resin. The whole collection is designed around a resin set channel and the Iris Ring is the largest channel allowing the most amount of colour coverage and boldness. Like the rest of the collection, I use gold or silver with many precious gemstones and a variety of popping colours. Launching the rest of my collection of course, reminding people that colour brings joy and secretive gemstones are a buzz. And I’m most excited to see people putting their own spin on the pieces; styling and wearing the jewellery in their own fashion-forward way is always fantastic to see. The pieces take a life of their own the moment they leave my studio and that’s the best part.